Today in school, a popular question is whether or not students should bring their cell phones to class. For a long time, this question was answered with an emphatic “no way!” by many educators and parents. It was believed that students’ phones would cause distractions and would take away from the learning process. Over time, however, students and educators have been proving that the opposite is really true. Bringing cell phones to class could be a disruption to the learning process at first, but with intentional implementation, that initial disruption can lead to some pretty great things. When students use devices in school, the ones they are comfortable using outside of school (like their own cell phones), student engagement increases, classrooms become more student-centered, and the learning process becomes more authentic. Personally, I wasn’t convinced that students bringing their phones to class was a good idea until about five years ago. I had been using Google apps with my students for a few years already, usually on the school’s desktop computers or with laptops I signed out from a cart. I embraced technology, and had even written grants to outfit my classroom with more electronic equipment in order to further engage students, but students using their own devices on a regular basis was not part of the picture. Then one day, a student — who was pretty reluctant to work on her reading and writing assignments — asked me if she could take notes for her independent reading book on her iPod. At first I thought she was trying to get out of the assignment, but I was also a little bit curious to see what she would do, so I went ahead and said yes. I watched her open up the notetaking app, that she had found and installed on her own, and read her book, stopping periodically to record her notes in the app, the kind of notes that I had modeled for her all along. I almost couldn’t believe my eyes when I saw the volume of quality thinking she was recording in the app; it was far and away a much higher caliber of work than what she typically wrote in her notebook or on sticky notes! I could see right then and there that she understood the day’s reading lesson and was immediately applying the lesson to her own work. Bringing her iPod to school and being allowed to use it in class was a transformative event for this student — and for me. This student went on to use her iPod in class regularly, and she used it for checking our class website, commenting on our class blog, drafting writing assignments, and more. She became a highly motivated student once she started to do the work on her iPod, a device that she was comfortable with and brought in from home. Students use their phones for many reasons in class including viewing, listening, reading, creating and saving digital information. That same year, I watched how a personal laptop enabled one of my students with dysgraphia to become a more prolific and confident writer. I watched another (highly distractible) student take his cell phone to the corner of the room, plug in his earbuds to tune everyone out, and write — on the phone — for the entire class period. (The phone and the music he was listening to weren’t distractions; they actually reduced distractions for him and kept him focused on his task!) I watched students film and edit videos right there in class on their phones, and then play them back for their peers. My students expressed to me that they wanted experiences like these to be a common practice in our class and in more of their other classes as well. Because they believed so strongly that having their own devices — phones included — was helping them perform better in school (not to mention enjoy what they were doing!) these students came in during their free time to work together on projects and even collaborated in their spare time on a presentation about technology to share with parents and other teachers in the hope that more teachers would allow them to use their phones and other devices in class. They wanted everyone to know how the use of their personal technology, whether on a computer, a tablet, or a cell phone, was transforming their learning experience. For me, there was no turning back. We now know that this shift in allowing students to bring cell phones or other electronic devices was and is still happening in many other classes, but — even now — it is not happening equally in all classes. As with any element of education, individual teachers, schools, districts, and states have approached the situation from different directions. Personal philosophies and experiences have shaped each decision about students using their cell phones differently. There are teachers in schools all over the world who are still strategizing ways to keep students from using their phones in class, even thinking of ways to collect the phones before class begins so that students don’t have access to them at all while they are learning. For some people, the concern is really about equity, because not all students have their own cell phones or other devices and if they do, they don’t have the same exact devices as one another. This line of thinking has lead to initiatives in which school districts provide devices (usually a tablet or laptop of some kind) for each student to use. In other cases, when providing each student with a device is not an option, BYOD has become a popular practice, but cell phones are not always invited as an acceptable device for students to bring in. Either of these models mentioned above — school provided devices or BYOD — mean that, while many students have access to technology while they learn, it doesn’t necessarily mean that they are allowed to use their cell phones. 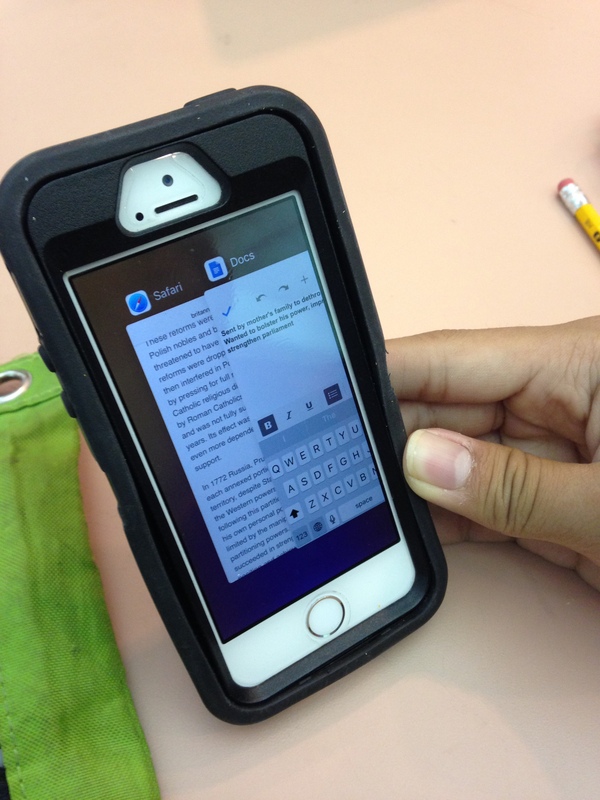 Here, a student demonstrates splitting the screen on his cell phone to work in two windows at once, one where he is reading information, and the other where he is writing. It’s interesting when we educators talk among ourselves about using cell phones for school work. Many teachers and other adults will say things like “students can’t write essays on their phones” or that “the screens are too small” or that “mobile versions of sites are harder to use than desktop versions”, but time and time again, students keep showing me that many of them see things differently. Students show me over and over again that they can and do write entire essays, make presentations, edit videos, and create other projects on their phones. Students have shown me that they not only find the screen size appropriate for what they want and need to do, but they can split the screen to have more than one window open while they work on their phones. Just as some students prefer a nondigital option for reading or writing tasks over a digital one, some students prefer their phones over a computer or other electronic device. At the end of the day, we need to think about what is best for our students as individual learners not what is easiest for teachers to manage, keeping in mind that just as each student learns differently, he or she may prefer different learning tools. If we know that using a cell phone is a way for students to take ownership of their learning, to fully engage in the learning process, and to connect what they are learning in school to what they do and use outside of school, why are so many teachers still fighting it? ~What did YOU do in school today? Did you talk about the question of cell phones in the classroom? Leave a comment below and keep the conversation going. I have the good fortune to pursue a new opportunity for the upcoming school year. I will be “leaving” the classroom to work as a teacher resource specialist for technology in my district. Though I will not be assigned to any one group of students, I am looking forward to working with the students in other teachers’ classrooms, co-planning, co-teaching, and developing resources for 21st century instruction. I teach middle school. When most people hear this, their faces immediately scrunch as if they just smelled something terrible, and they quickly confess that those were their most challenging years. Many people even go so far as to say they hated middle school. They remember middle school being tough for reasons beyond the constant exposure to an increasingly difficult curriculum. Transitioning from elementary to secondary school is full of academic challenges – and social pressures for today’s students – maybe even more than we may realize, or more than what we can remember from our own experiences. Though it may be a difficult time, these middle school years are absolutely critical for preparing students with the skills and strategies they will use and build upon for the rest of their lives. Understanding that my students have challenges and difficulties – and finding relevant and effective ways to help my students overcome them – is what makes my job so rewarding and meaningful. My goal is that someday, when my students are grown and they are reminded of their middle school years, they will not scrunch their faces and, instead, will have many positive memories to reflect upon – because of what they learned, and the people they became while we worked together. I am happy to report that my goals are still in tact. In addition, my goals include empowering other teachers and providing them with resources to give their students positive and meaningful learning experiences. I’m looking forward to this new opportunity and the new school year!